Siamese cat breed information and advice. Siamese cats are mischievous, intelligent, loyal and loving! Be prepared as your life will never be the same again once you open your door - and your heart - to a Siamese! Owners and breeders of this loud and loveable breed cannot speak highly enough of them, and promise that while a Siamese will change your life, it will certainly be for the better. Ross Davis of the Siamese Cat Association simply adores these graceful beauties: "They are more intelligent than most other breeds - they are very outgoing and friendly and love human company. They're very doglike and will even play fetch with you!" Niki Hill of the Siamese Cat Club agrees: "There is no doubt that Siamese are very vocal and individual, often displaying idiosyncrasies which can be funny, endearing and very naughty. If you like your cats to be loyal, loving and sometimes challenging, a Siamese may be for you." While Siamese are very affectionate lap cats who enjoy having cuddles, they are also one of the liveliest (and nosiest) breeds. They can open doors, drawers and even windows as Ross once found, and he has taken to putting child locks on his cupboards to keep out inquisitive Siamese noses! Niki adds: "Siamese are not cats for everyone but if you want an active, determined cat with a distinctive yowl and conversation you may be ready to lose your heart to a Siamese, but remember once you fall for a Siamese it can be a life time obsession!" All Siamese are 'pointed', which means that they have colour on their faces, tails and legs, while the rest of their body is cream or white. 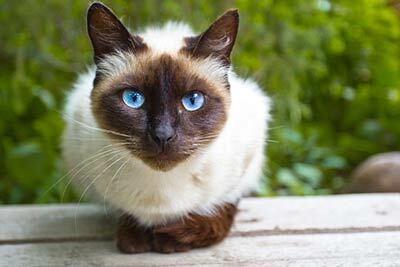 While the seal-point is the most well-known pattern in the Siamese, there are now more than 34 different colours and patterns in the breed, including chocolate, blue and lilac points, caramel, red, cinnamon and fawn, as well as tortie and tabby. They are famous for their beautiful blue eyes and large, bat-like ears, with long, lithe bodies and thin, whip-like tails with soft shorthaired coats. Old Fashioned or Traditional Siamese cats have more rounded faces than their modern counterparts and have shorter bodies. Many breeders are devoted to keeping the old look going. In the past, some Siamese were prone to having lymphosarcoma, a common cat cancer, and Progressive retinal atrophy (PRA) was also detected in earlier lines. But breeders have worked hard over the years to screen their cats from these diseases. While they may be a high maintenance breed to keep up with, to compensate they have a very low maintenance grooming routine with just hand groom needed to keep their shorthaired coats smooth. Niki says: "Siamese have an ill-founded reputation for being delicate in constitution and in need of special food. Nowadays we know that Siamese do best on simple, good cat food, and in fact they are often better on the less rich brands." The Siamese is one of the oldest breeds in the fancy, and there are several myths and legends about them. It is believed that the cats belonged to the Royal Family of Siam and were used as guards of the ancient temples. Siamese originate from Thailand and a British diplomat working there in the 1800s discovered the cat. In 1884 the departing British Consul, General Gould, was given a Siamese as a leaving present and the cat's kittens were were shown by his sister at the 17th Chelsea Palace Show in 1885. At that time there were four main colours - seal, chocolate, blue and lilac point - and over the years breeders have introduced many other colours. Siamese kittens Kittens vary in price depending on the part of the country, but on average you can expect to pay between £350 and £500. Most breeders specialise in specific types and colours of Siamese and you may have to travel if you are after a specific colour. Ross advises buying from a registered breeder and make sure you visit them in their home: "Look for outgoing, friendly kittens that show no signs of illness. Never buy a kitten that is not well. The breeder should complete any treatment before the kitten leaves home." Remember! All breed profiles are general and every cat is individual.